TALLAHASSEE, FL – The Florida Retail Federation (FRF), the state’s premier trade association celebrating more than 80 years of supporting Florida’s retailers, is reminding both retailers and consumers of the upcoming Back-to-School Sales Tax Holiday weekend, taking place August 3-5. During this “holiday,” consumers will not have to pay sales tax on thousands of eligible items such as clothes, shoes and school supplies. The sales tax holiday also benefits Sunshine State retailers who see increased sales and as a result, create new jobs for hard working Florida families. Serving as the state’s second busiest shopping “holiday” behind Black Friday, this year’s list of eligible items includes clothing, shoes and bags costing $60 or less and school supplies $15 or less. Nationally, the average family is expected to spend $684.79, down slightly from last year’s average of $687.72, but still totaling more than $27.5 billion nationally – the third highest total in survey history, according to FRF’s national partners at the National Retail Federation’s annual survey conducted by Prosper Insights and Analytics. Those with young people heading to college as well as college and graduate students purchasing for themselves plan to spend an average of $942.17 each, down from $969.88 last year for a total of $55.3 billion nationally. That’s an all-time high in the history of the survey, up from last year’s previous record of $54.1 billion, due to more people shopping this season. The survey also found that more consumers are starting early. Most back-to-school shoppers (77 percent) plan to start at least three weeks before school begins, up from last year’s 74 percent and 64 percent a decade ago. Moreover, 67 percent of college shoppers will start that early, the same as last year but up from 51 percent in 2008. However, there is still plenty of shopping left to do. Nearly nine out of 10 (89 percent) back-to-school and college shoppers still have half or more of their purchases left to complete. Of these, more than half are still waiting for the best deals for the items on their lists. The survey found teenagers will spend $35.60 of their own money on average for back-to-school while pre-teens will spend $25.06. The back-to-school sales tax holiday has been one of the most popular shopping holidays among consumers and retailers and has been providing vital tax relief since it first began. The holiday has been recognized in 17 out of the 21 years since it first began in 1998. This year will mark the 9th year in a row it has taken place. For the complete list of eligible tax-free items, see www.floridarevenue.com. 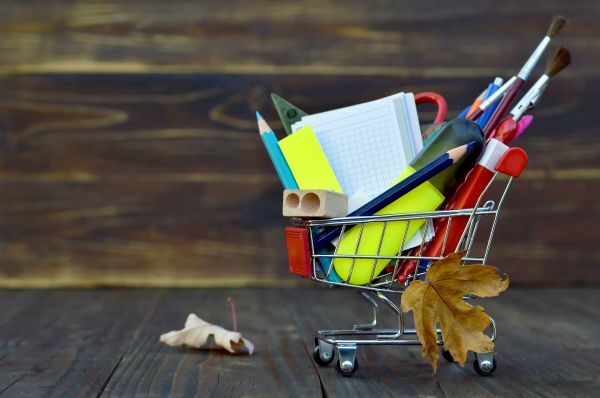 The Florida Department of Revenue (DOR) just released the list of eligible items for the 2018 Back-to-School Sales Tax Holiday. This sales tax holiday begins Friday, August 3, 2018, and runs through Sunday, August 5, 2018. During this period, qualifying items will be exempt from tax including: certain school supplies selling for $15 or less per item; and clothing, footwear, and certain accessories selling for $60 or less per item. For more information and a list of qualifying items, please visit the Department of Revenue's Back-to-School Sales Tax Holiday website. There you will find DOR’s Tax Information Publication (TIP), as well as a Frequently Asked Questions document. For your convenience, the Department also created digital downloads and social media posts for businesses interested in sharing information about the sales tax holiday. Three days of tax-free, back-to-school shopping starts Friday, Aug. 4, and stores are expected to be packed despite the internet’s growing encroachment on brick-and-mortar retailers. Nearly three times as many shoppers plan to visit stores compared with shopping online for back-to-school sales, according to a survey from New York City-based research and auditing firm Deloitte. Mostly, consumers will go online to purchase items such as computers and computer hardware such as printers and hard drives. Parents, store managers and researchers said brick-and-mortar has the advantage on back-to-school shopping, for now, because prices are lower in stores for school supplies and picking the correct sizes for kids can be difficult. That means aisles will be crammed with parents and students next weekend when the back-to-school shopping season culminates Aug. 4-6. Shoppers won’t pay the 6 percent to 7 percent state and local sales tax on clothing, shoes, backpacks, school supplies and computers under $750 starting at 12:01 a.m. that Friday until 11:59 p.m. Sunday. The sales tax discount is also good on many online purchases for Amazon.com, Walmart.com and Target.com. Adding to the crowds, retailers also tend to pile their own discounts on top of the sales tax relief, pulling more shoppers into stores. Many will be heading to mass merchants such as Wal-Mart and Target, according to Deloitte’s survey. School supply lists in hand, Christina Doolittle and her two elementary age sons grabbed a cart at SuperTarget on Millenia Plaza Way in Orlando Wednesday. Jack, 10, and Grey, 8, crossed off items as they picked through erasers and highlighters and decided which folders to buy among a rainbow of options. “I haven’t bought anything online for back to school, even though I order a lot of stuff on Amazon at Christmas,” said Doolittle, who lives in Orlando. Wednesday’s Target trip was her last back-to-school-shopping stop, as she hoped to buy supplies and clothes before the crowds of the tax-free weekend. Buying school supplies is tough online, she said, because items aren’t available in small quantities. Schools and teachers also have specific requirements for items such as folders. It’s safer to head to the store, she said. Physical stores have some distinct advantages, Kirn said. Kirn said online sellers could have an advantage on items such as computers and hardware, where size and processing power is more important than touch and feel. “A computer is a computer no matter where you are in the country,” Kirn said. The Florida Legislature sets the tax-free period every year. This year’s holiday is three days and gives an exemption on shoes and clothing items up to $60 each, school supplies less than $15 each, and computers less than $750. Backpacks also must cost less than $60 to qualify. Shoppers can also skip the sales tax on dozens of related items from tuxedos and diaper bags to coats and cleats. The program is expected to save Florida consumers about $33.2 million in state and local sales taxes, according to estimates from the Florida Office of Economic & Demographic Research. As recently as 2015, Florida shoppers were given a 10-day sales-tax holiday, but that cost state and local governments about twice as much in sales tax revenue. Most shopping still happens in stores and back-to-school season is a good example of where brick-and-mortar has an advantage, Florida Retail Federation spokesman James Miller said. According to the U.S. Census Bureau, about 8 percent of all retail sales happen online, including grocery sales. Another reason, Miller said, is that children can grow quickly and make it difficult to buy accurate clothing sizes online. TALLAHASSEE, FL – The Florida Retail Federation (FRF), the state’s premier trade association celebrating its 80th year of supporting Florida’s retailers, is reminding Floridians and retailers of the upcoming back-to-school sales tax holiday weekend, taking place August 4-6. Serving as the state’s 2nd busiest shopping “holiday,” the weekend is expected to bring in near record-breaking sales, while Floridians are able to stretch their hard-earned dollars further and employees benefit from additional jobs and wages. Additionally, this year’s holiday sees the return of eligible technology items up to $750 tax free, which means substantial savings for Florida families. Nationally, the average family is expected to spend $687.72 on apparel and accessories, shoes and school supplies, up eight percent from 2016, according to FRF’s national partners at the National Retail Federation’s annual survey conducted by Prosper Insights and Analytics. Nationally, sales for this back-to-school shopping weekend are expected to reach $83.6 billion, a more than 10 percent increase from last year’s $75.8 billion. Families with children in elementary through high school plan to spend an average of $687.72 each, for a total of $29.5 billion, an 8 percent increase from last year’s $27.3 billion. Total spending is the second-highest in the history of the survey following a peak of $30.3 billion in 2012. According to the survey, back-to-school shoppers plan to spend $10.2 billion on clothing (purchased by 95 percent of respondents), $8.8 billion on electronics such as computers or calculators (60 percent), $5.6 billion on shoes (93 percent) and $4.9 billion on school supplies such as notebooks, folders, pencils, backpacks and lunchboxes (97 percent). Parents say they will spend an average of $238.89 on clothing, $204.33 on electronics, $130.38 on shoes and $114.12 on school supplies. While consumers plan to spend more across all categories, shoes and school supplies seeing the highest expected increase. For the first time, the survey asked consumers what types of electronics they plan to purchase. Among electronics shoppers, 45 percent said they would buy a laptop computer while more than a third plan to purchase a tablet (35 percent) or a calculator (35 percent). One in four plan to purchase electronic accessories such as a mouse, flash drive or charger. According to the survey, 65 percent of back-to-school shoppers say half or more of their purchases are a direct result of their children’s influence, up from 57 percent last year. And while children’s influence is growing, so too is their willingness to help their parents pay the bill: teenagers will contribute $37.64, up from last year’s $32.90, and pre-teens will contribute $27.09, up from last years $20.08. More families will tackle their back-to-school lists early this year with 27 percent beginning two months before the beginning of school, up from 22 percent last year. But not all shoppers are early birds, 21 percent will wait until the last week or two before school starts, about the same as last year’s 22 percent. Of those shopping early, 60 percent say they are trying to spread out their budgets, 48 percent don’t want to miss out on sales and 43 percent want to avoid crowds. When it comes to where parents will buy, they are shopping across a variety of retailers; 57 percent will shop at department stores, 54 percent at discount stores, 46 percent each at clothing stores and online, and 36 percent at office supply stores. For those shopping online, 91 percent plan to take advantage of free shipping and 54 percent will buy online and pick up in-store. The back-to-school sales tax holiday has been one of the most popular shopping holidays among consumers and retailers and has been providing vital tax relief since it first began. The holiday has been recognized in 16 out of the 20 years since it first began in 1998. This year will mark the 8th year in a row it has taken place. For the complete list of eligible tax-free items, see floridarevenue.com/. We are very pleased that our work with the Florida Legislature ultimately included provisions for a Disaster Preparedness Sales Tax Holiday during the 2017 session. This sales tax holiday will encourage Floridians to stock up on the supplies they need to be prepared for the hurricane season and other potential disasters. This holiday is coming up VERY SOON! The bill is currently waiting for Governor Scott’s signature to make it official, but we wanted all of our members to be well aware of the details of the holiday so that you can prepare and make the most of this event in your stores. We have reached out to the Department of Revenue to inquire when we can expect to receive the TIP sheet on this event. In the meantime, here are the details that you may need to get ready. When is the Disaster Preparedness Sales Tax Holiday? What items fall under the sales tax holiday? A portable self-powered light source selling for $20 or less. A portable self-powered radio, two-way radio, or Weatherband radio selling for $50 or less. A tarpaulin or other flexible waterproof sheeting selling for $50 or less. A self-contained first-aid kit selling for $30 or less. A ground anchor system or tie-down kit selling for $50 or less. A gas or diesel fuel tank selling for $25 or less. A package of AA-cell, C-cell, D-cell, 6-volt, or 9-volt batteries, excluding automobile and boat batteries, selling for $30 or less. A nonelectric food storage cooler selling for $30 or less. A portable generator used to provide light or communications or preserve food in the event of a power outage selling for $750 or less. Reusable ice selling for $10 or less. Does everyone who sells these items have to participate? The tax exemptions do not apply to sales of the above items that take place in theme parks or entertainment complexes, lodging establishments, or airports. Every other retailer must provide the sales tax exemptions on the items above during the designated time period. When we receive further details from the Department of Revenue, we will send it out immediately. If you have any further questions, please do not hesitate to contact us.